As a Head of Training, your core mission is to support the productivity of your team and empower them to make the right choices, even when they aren’t being monitored. To do that, of course, you’ll truly need to own your employee productivity tracking – the smart way. In this post, we’ll take a look at the right steps to take for developing an agile plan for employee productivity monitoring. You might have known this, but you might not know that a dip in productivity can often be traced back to the onboarding process and the efficacy of ongoing employee training. That’s why a learning management system (LMS) could be a wonderful component for your employee performance management strategy. Yes, you are lucky to have hard workers who help your team meet its goals, but even team members with the best work ethic can be discouraged from day one because of a poor onboarding process, incomplete employee training, or unclear employee risk management guidelines. Your best employees should have access to tools that empower them to self-monitor their efforts to meet team performance goals and get the instructional support that they need when they find themselves falling short. While ramping up your employee productivity monitoring activities is a logical next step if you find that your team’s performance is failing to meet company objectives, it is important to avoid your enhanced efforts harming your own productivity. Without a seamless performance monitoring system, attempting to scale up employee productivity monitoring can be a recipe for disaster—meaning less productivity on your part as you attempt to manage performance reviews across different platforms. Your first critical action in employee productivity monitoring is determining if you have the right system in place to evaluate current performance trends. The right system is agile enough to deal with multiple levels of performance evaluations, scalable, and provides a frictionless user experience. It should lessen, not increase the administrative burden on you and your staff. While it is tempting to focus employee productivity monitoring on remedying low performance, it is also essential to identify high performing employees and ensure that they continue to stay ahead of the pack. With an enterprise-grade LMS, it is possible to do both—develop the skill sets of your most valuable employees while creating needed educational interventions for lower performing employees on the fly. If you are using an integrated LMS and performance monitoring system, then your easy access to employee productivity data allows you to target educational interventions (and positive reinforcement for highly productive employees) with ease. This step, of course, isn’t DIY. As your company grows, you’ll encounter new types of skills and professional competencies that incoming employees will need to demonstrate and maintain. 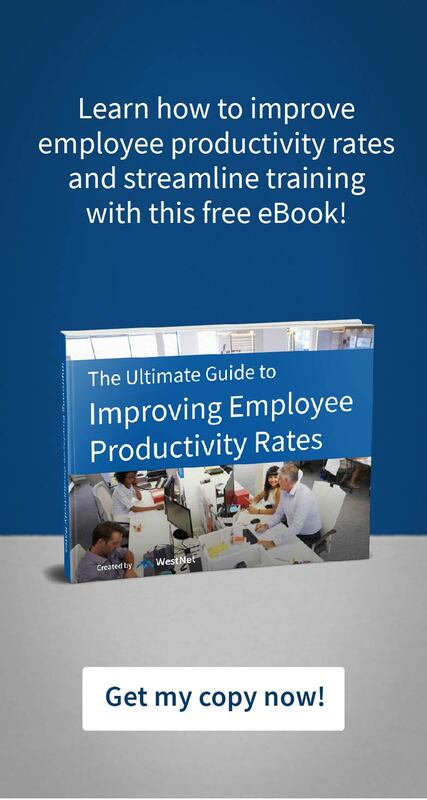 Meeting this challenge requires that you have a system that can accommodate the changing needs of your employees, as well as a diverse range of employee productivity monitoring tasks that will be different from year to year. Tracking employee productivity is often a time-intensive exercise that can, ironically, impact training department productivity. The more successful your company, the more diverse (and resource intensive) your performance monitoring needs will be. An integrated employee productivity monitoring and learning management system helps HR and training departments focus on critical tasks while creating remedies for potential employee productivity issues. An effective employee productivity tracking system is an essential part of an agile organization. Here are five rules to help you choose the right employee performance-monitoring platform. Employee productivity tracking is key to elevating organization-wide productivity levels.The right system will serve as a navigational system for your HR team, helping your organization manage HR resources effectively. In absence of a seamless method to apply actionable insights on employee productivity, you will waste time integrating issue-specific training content into an educational intervention plan when problems arise.Choose a platform that integrates performance monitoring and educational intervention seamlessly. Productivity loss only gets worse over time, adding to per employee costs and lost revenues.Choosing a platform that scales easily saves your company time and investment from day one. A system for monitoring employee productivity must be user-friendly and easily scale for it to serve its purpose effectively.If your productivity monitoring system has a steep learning curve that interrupts workflow, then it is defeating its purpose. Employee productivity tracking empowers training departments to pinpoint employee performance roadblocks across the organization. When performance issues can be accurately and easily identified through a digital platform, training departments save time that may be used to develop practical solutions for poor performance trends. The impact of strategies designed to improve employee productivity can be readily analyzed with an enterprise-grade system. A dedicated LMS allows training departments to take insights from employee productivity monitoring reviews and easily create educational interventions that work in the existing LMS. If you would like to learn more about how you can tackle your employee productivity the smart way, reach out to WestNet and schedule 1-on-1 strategy session today!